Twelve years ago, it was an ordinary Tuesday night at the ballpark. On June 18, 2002, the Anaheim Angels played in St. Louis, facing the Cardinals for the first time ever. More than 39,000 people gathered at Busch Stadium, which was a toasty 88 degrees at game time. No surprise at the temperature — it was St. Louis in June. No one knew the significance of this night, this game, right then. No one knew what the date would come to mean for Cardinals fans or in Cardinals history. It was simply a baseball game on a Tuesday night. Darryl Kile returned to the pitchers mound for the top of the eighth inning, working on a shutout. Both were season firsts for him, going that deep into a game and holding the opponent scoreless. Twice he’d pitched seven innings, both times allowing an earned run, in what had thus far been an up-and-down year. He didn’t win a game until April 24, then lost three straight. Since mid-May things had been better, three consecutive wins until he hit a bump in the road in his most recent start: five earned runs in only 4 1/3 innings, his shortest outing of the year. His record was 4-4, his ERA 3.97. Now, in this game, more improvement. Kile held the Angels hitless until the third, then allowed back-to-back singles. A fourth inning double was the only other hit he’d allowed, plus he’d struck out five and only walked one. By contrast, Angel Kevin Appier’s night was awful — thus good for the Cardinals. They began the game swinging and scored once in the first, twice in the second and three times in the third. Kile got into the act in the second inning, as a sacrifice attempt following singles by Edgar Renteria and Mike Matheny ended instead with him safely at first. Bases loaded, no out. Fernando Vina followed with a sacrifice fly and, after a Placido Polanco single, J.D. Drew drove in Matheny with a ground-out. The next inning, Jim Edmonds started the scoring with a solo homer against his former team and, two batters later, Renteria homered. Appier was done after Edgar’s homer, recording no outs in the third, and things settled down. The Angels’ relievers kept pace with Kile and turned the game into a pitchers’ duel. The score remained 6-0 as Kile returned to the mound for the eighth. First up was pinch-hitter Benji Gil, who did what he ideally should in that situation by launching a line drive deep to center that Edmonds couldn’t catch. Gil ended up at second base with the Angels’ fourth hit of the night. Lead-off man David Eckstein was next. He had one of those Angel hits, the first of the game. No repeat performance here, though, as he grounded to Polanco at third. He threw across to first baseman Tino Martinez. One out. Next up: Darin Erstad. He was soon the first Angel with two hits in the game as he singled to center. Gil scored from second to put Anaheim on the board. Then came Troy Glaus, who hit a fly ball to center. Two outs. One last pitch remained for Darryl Kile. It was delivered from the stretch to Garrett Anderson, who promptly lined it into right field for a single. “The ball just jumped off his bat,” Joe Buck said on the television broadcast. Drew fielded the ball and threw it to Renteria covering second base. Two on, two out, Tim Salmon coming to the plate — Tony La Russa made his way to the mound, for Kile was finished. Gene Stechschulte was taking over. Darryl Kile walked off the pitchers mound for the last time in his life. Buck correctly predicted on TV he “should receive a nice hand” as many of the crowded ballpark’s red-clad fans stood to applaud as Kile quickly made his way to the dugout. “Another strong start,” Buck said. Such a routine move, the starting pitcher leaving the game. Such a typical gesture, the ovation as the starter exits. And on this night, that’s all it was: another game on another night in a six-month season. A good game, indeed a strong start for Kile in what was ultimately a Cardinals 7-2 win. A significant victory, for it put the Cardinals into sole possession of first place in what had been their own up-and-down season from mid-April to mid-June. They’d remain in first place the rest of the season. But had we known it really wasn’t just another June night, how would we have responded? 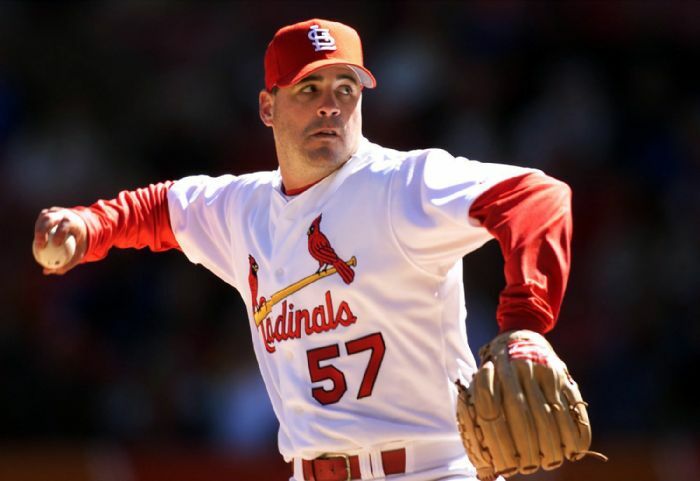 If we’d known Darryl Kile was pitching for the final time ever, that three nights later the 33-year-old would go to sleep in a Chicago hotel room and never wake up again, what would we have done differently? What if we’d realized then what Joe Buck was going through as he broadcast the game, knowing his dad and our beloved broadcaster Jack would die that very evening? How would we have paid tribute? What possible ovation could there have been to demonstrate how much Jack Buck meant to us, how much we valued Darryl Kile? If we had known, what would we have done? The sadness, the heartbreak, the tears, the pain, that aching and helpless feeling of seeing our Cardinals hurting even worse than we were, the JFB and DK57 patches and tributes … those were all still ahead, unknown to us right then. We enjoyed that game on June 18, 2002, whether at the ballpark or watching on TV or listening on the radio. We appreciated watching Kile pitch so well, perhaps thought about what a positive sign this was for the season still ahead, and we welcomed the victory over the Angels and the move ahead of the Reds into first place. It was still an ordinary Tuesday night. This entry was posted in General Cardinals and tagged 2002 Cardinals, Darryl Kile, Jack Buck, Joe Buck by Christine Coleman. Bookmark the permalink. I worked the Manual Scoreboard during 2002 and remember this game so clearly. He pitched so well that night. It was muggy yet the Cards romped and Kile did take that walk. He had the strut of a gunslinger when he strolled the field. He was a cowboy out there. I miss him to this day and was going to write something on his anniversary. Thanks for writing this. It truly took me back. Nice piece of writing, Christine. I really enjoyed this. So proud of everyone in the Cardinal Nation. We are so special, we feel every loss for so long afterwards no matter the distance, place or time. It is what makes our victories , class, poise, and surprise in ourselves so mesmerizing to all the others. We won’t ever lose that because we know how to look forward to a bright tomorrow. Take care and God Bless. I was at that game as an Angel fan visiting friends in St. Louis. Sat out in left field and had a great time despite the score. Was there the next night for the Jack Buck ceremony too. Then we all drove to Chicago and saw the Cards last game there the day before Kile passed. I will never forget those moments I shared with St. Louis fans. nice. but im a little disappointed you didnt do the same for jack buck yesterday. Daryl Kile Class of 86′ Norco High School. Rest in Peace. It was a wonderful evening before such deep pain. I will always love him. His kids are a wonderful reminder to me. Beautiful tribute. Thank you. I often still find myself thinking of my old high school friend who always made me smile. Although at one time we were very close, our lives went off in different directions and some how we lost touch shortly after he left for Texas to the baseball training center. Still, I always felt a connection to him through his chosen career. It was such a pleasure following him throughout his baseball career and knowing he made it to exactly where he wanted to be in the Big Leagues… I was so proud of him and his success! In some odd way, it always gave me a sense of hope and inspiration in my own life. It was a good feeling to know our lives had once crossed paths. Besides his career, he seemed to have everything he ever dreamed of including a beautiful family he adored and that meant more than anything to him. It is tragic that he was taken from them much to soon and I don’t think anyone will ever understand why, but I thank god for putting him in all of our lives for the short while he was here, as I know he has touched so many lives, both before and after his fame. I never really got to say goodbye and have missed him dearly. He was a good person and special friend, missed by all who ever knew him. God bless him and his family always and forever. Beautiful post and I’m glad it reached his family and friends. DK was a tough customer on the hill. One of those guys you liked having the ball in his hand. Thanks for this nice piece. I was friends with Darryl in high school, he was an all around nice guy!